A device to keep you ahead. Equipped with the Kirin 960 processor, the HUAWEI Mate 9 is the Android phone with blistering performance to run apps, videos and HD games seamlessly. The Vulkan graphics library produces double the frame rate*** for greater detail and seamless gaming. The new F2FS file system improves the I/O storage performance. This speeds up the database engine allowing pictures to load more smoothly. The optimized performance of the rendering engine gives better control and a faster reaction to your touch. 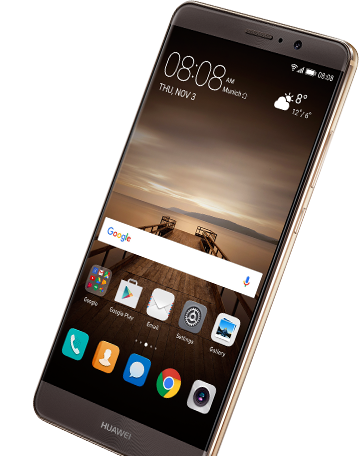 The HUAWEI Mate 9 automatically manages resources by prioritizing CPU, RAM and ROM for optimal performance and closes memory intensive background apps. Within the CPU, fine-grained scheduling maximizes computing efficiency. For RAM, it automatically recycles memory resources, creating more memory for priority apps and enabling stutter-free performance. And for ROM, it opens an exclusive channel of Storage I/O making the apps you use the most work even faster.